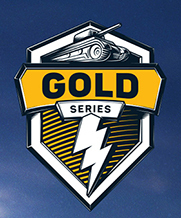 ► Gold Series tournament for Tier VII-VIII vehicles. Participation Tickets can be earned in the Silver Series VII-VIII tournaments. Registration opens at 8:00 AM (UTC -7) every Friday on the previous week and closes at 8:00 AM (UTC -7) on the day of the tournament. Tournament days ans start time: Sunday at 7:00 PM (UTC -7). Maximum number of teams: 32 teams. Number of players in a team: 7 players in the Party. Up to 2 reserve players. At least 5 players can join a battle. Battle mode: Double Elimination, Supremacy. Interval between battles in a match: 2 minutes. If the minimum required number of team members (5 players) does not turn up for the battle at the set time, the match will be forfeited for this team. A special room for conducting matches will be automatically created 5 minutes prior to the first battle. Check the Notifications section for the invitation. Play-off (Double Elimination) — 32 teams, 4 teams in a group. Battle format—Bo3. Grand Finals—Bo5. Battles in the Play-off are held within one day. A detailed schedule is available in the game client and below in the regulations. October-November: Middleburg, Mayan Ruins, Oasis Palms, Black Goldville, Port Bay, Vineyards, Naval Frontier. Every battle is played on one map with changing starting position. December-January: Middleburg, Mayan Ruins, Fort Despair, Black Goldville, Castilla, Port Bay, Vineyards, Naval Frontier. Every battle is played on one map with changing starting position. Within the group consisting of 4 teams, players battle in the Bo3 format (until 2 victories are scored) and in the Grand Finals—in the Bo5 format, according to the Double Elimination system. Total groups: 8. Upper bracket, Round 1 — 7:00 PM (UTC -7). Upper bracket, Finals — 7:30 PM (UTC -7). Lower bracket, Round 1 — 7:30 PM (UTC -7). Lower bracket, Finals — 8:00 PM (UTC -7). Grand Finals — 8:30 PM (UTC -7). The final schedule of the matches will be specified after the draw procedure in the game client. First place in the group — a Gold Series VII-VIII Ticket for each team member, 12 000,000 credits, 128 standard Crew XP boosters, 128 standard Combat XP boosters, and 1 600 Gold, 40 000 spare parts for team. Second place in the group — Gold Series VII-VIII Ticket for each team member, 7 200,000 credits, 96 standard Crew XP boosters, 96 standard Combat XP boosters, and 800 Gold, 20 000 spare parts for team. Third place in the group — a Silver Series VII-VIII Ticket for each team member, 5 600,000 credits, 64 standard Crew XP boosters, 64 standard Combat XP boosters, and 800 Gold, 8 000 spare parts for team. Fourth place in the group — a Silver Series VII-VIII Ticket for each team member, 8 000 spare parts for team. In case when team didn't play any actual match during the tournament, player don't receive team rewards. For example, team A won final but all victories were technical during the tournament. In this case team A players will receive only tickets as rewards. Quantity of player's reward depends on how many battles player played with team during the tournament. Rewarding process takes place on the next day after tournament will be ended (24 hours) via automatic rewarding system. If you did not received your rewarding 2 days after tournament ended - please contact with Support. Gold Tourney is touch only? Hello NIORA, now there are silver Tourney on Saturday night, and the registration for gold league ends in the morning of Sunday, it will have the same problem we had yesterday with silver Tourney. Please extend the registration of gold Tourney or reschedule the gold Tourney. Please extend the registration of gold Tourney or reschedule the gold Tourney. PC is still good gameplay. Because WG never fully thought out the implication of adding a PC client, and are avoiding actually addressing the issue instead of solving it as per usual. We never recieved our invites to play Heatr in the tier 8 gold Tournament @ 10:30 pm eastern. Could you please explain what's happened? No invite was sent for the last battle of the night, i need you to tell US what happened. Edited by Slab412, 31 July 2017 - 03:02 PM. Our apologies for not fielding a full team Ryan, the keyboard and mouse exclusion caught us off guard. Not to take anything away from your win, we will always show up to fight no matter how short handed. No invites were sent for that battle to anyone of us. Sad thing is we did have our 7th guy online at 10:30. That should be clearly visible server side that none were sent. The “Touch Only” has nothing to do with WG not wanting to address it. This is a mobile game first and foremost, in competition, players must be on a completely level playing field. This is the easiest solution to that. You said it was at 10:30. Every player see start time of the tournament in the game client by the time set on his device. The tournaments start at 6:00 PM (PT). Is everything correct? Was is 6:30 PM (PT)? Edited by Niora, 02 August 2017 - 11:47 AM. Niora, what are we going to expect regarding the reward on clan hall of fame?